Moving to a larger, more remote block has given the Wakeford family of Hawke’s Bay the opportunity to pursue their hobbies on a grander scale. Aaron and Ange, plus 18-year-old daughter, Hannah, already had a taste for lifestyle property, having lived on four hectares near Hastings since 2014 and, for 11 years prior to that, on a four hectare block, where they built and ran a successful commercial horse arena. 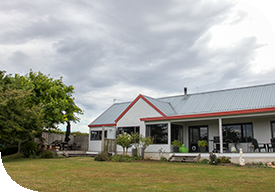 In December last year, they took their next step to a 20 hectare Waipawa property. This gives Ange and Hannah greater scope to run their horses, while Aaron is building a shed and taking regular excursions with his fishing tackle to the river that bounds the property. Running their electrical contracting business, Aaron Wakeford Electrical Limited, which they manage from home, has continued without a hitch, as Ange explains. “We started the business in 2002 in Hastings, where most of our customers are based. It has grown since, and we now have additional staff. Moving to a larger property, further away from the city, has been straightforward and has helped us enjoy more of the things we love, without putting any additional pressure on us or the business,” she says. Hannah competes in local equestrian events, showing miniatures, though is heading to Auckland to study spatial design and architecture so will not be around to enjoy the glories of Waipawa as much as her parents. Ange, meanwhile, is rearing calves. “I grew up on a Reporoa dairy farm so I love the cows. We are building two big sheds here, starting with weaner heifers, then intend to go into calf-rearing, doing four-day-olds,” she says. Fiona Barrett of PGG Wrightson Real Estate, Waipukurau, assisted the Wakefords to work through their move, on both sale and purchase. Fi, along with her colleague, Doug Harvey, introduced the Wakefords to this property, that they thought might suit Ange and Aaron’s needs. “We always wanted to find a bit more land and realised we had to go further from town. We were always looking and knew that we were going to sell at some stage, then this came up. “Being a bit further out, taking a step back, this is so lovely and quiet. We knew right away, it was what we were looking for and it didn’t take long to sell ours. We looked at this with Fi and Doug and decided that’s what we were going to do. In the end, it only took a couple of months,” says Ange. For the four-legged members of the family, it has been a great move as well. “Our three dogs just love it. Our old Rottie jumps on the back of the trailer when Aaron heads off fishing and they have a great time. They love being so close to the river,” says Ange.